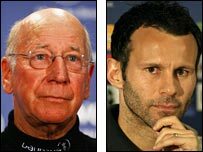 Manchester United legend Sir Bobby Charlton believes 10-time title winner Ryan Giggs deserves to break his appearance record for the club. Giggs equalled Charlton's club record of 758 games when he came off the bench to score in Sunday's 2-0 win at Wigan and seal the Premier League crown. The 34-year-old could now break the record in the Champions League final against Chelsea in Moscow on 21 May. Charlton said: "If I could choose someone to break it, it would be him." Giggs, who made his debut for his only professional club back in 1991, will have the chance to add to his United appearance tally next term and Charlton added: "The day he came to Manchester United, I knew he was special. "He is a great athlete, a great person and a great footballer. Nobody deserves to break records like he does. "You need to be here for a length of time to understand this club and the strength of feeling that underpins it. "His record with United is unbelievable and I'm really proud of him. I have forgotten about my record already." Charlton's Old Trafford career started with his first-team debut in October 1956, and lasted until he left the club in 1973. The 70-year-old made his way to the tunnel area at Wigan's JJB Stadium on Sunday to congratulate Giggs on his feat and celebrate United's latest title triumph. Charlton, who is now a director at United, is now looking ahead to the Champions League final date with Chelsea. "It would be fantastic to win the Champions League as well," he said. "It will be hard but we will give it our best shot. We will be ready that's for sure." Manager Sir Alex Ferguson said it was fitting that Giggs scored the goal that secured the title. "It was fantastic for Ryan to get the goal that mattered," he said, "but maybe it was fate. "He deserves it because he's been a credit to the game and having known him for 20 years, to equal Bobby's record on the day he scores the goal for us, well it's just fantastic. "It was amazing. As soon as it started raining, I was thinking, 'how am I going to get Giggs into this game?' because he is fantastic on soft ground with his balance and ability to beat a man." Giggs said: "I said before the game that I am not bothered about records. This is what it is about, championships and trophies. I hope we can win another one in 10 days' time."